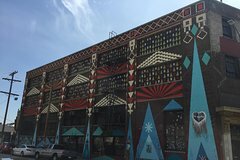 This is a 2-hour walking tour of the Arts District with a focus on art galleries, murals and transition of a neighborhood from warehouses to urban living. Step inside LA's Art Share program, visit the largest art gallery in the United States, photograph world-famous murals and meet locals on one of LA's most artistic tours! Discover two centuries of LA's history as we travel through the evolution of the Arts District from California's first commercial vineyards, to bustling industry, to abandoned factories, to artist's mecca, and ending with an urban oasis! We will visit world-class galleries, meet the early pioneers and see some of LA's best street art. On this tour, you will see the largest art gallery in the United States. From there, we'll see murals from local LA artists and those with worldwide recognition. The tour guide will then lead you into some hidden art galleries and also point out neon and 'out of the box' art galleries that reside in the Arts District. You'll see a legendary 'Punk Place' where local bands and internationally known rock bands got their first start. You can take a photo with wings in the background, to show that you are an 'Angel' of Los Angeles. Finally, you'll step inside Art Share, LA's largest private art warehouse, and talk to the local artists.